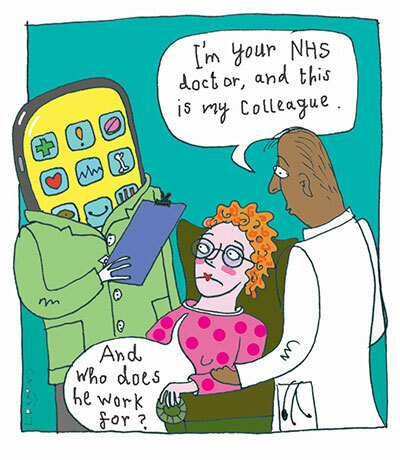 I trained as a doctor – and while working in hospitals I was struck by how little technology doctors used in their working lives. Yet digital tech could dramatically transform healthcare. For some years, I’ve worked with healthcare businesses on improving the delivery of care. I help digital health start-ups to understand the sector and develop their business models, and I advise investors and health providers on where to put their money. Some digital technologies can be really powerful. For instance, lots of people with mental health problems struggle to access cognitive behavioural therapy (CBT) via the NHS. But Sleepio, a British company (not a client of mine) has created an app providing CBT for insomnia. Crucially, it’s really evidence-based: they’ve published dozens of peer-reviewed trials and papers, most recently in JAMA, the journal of the American Medical Association. The new health secretary is excited about technology: he wants to move on from the traumatic experience of the National Programme for IT, which left many health organisations wary. But I don’t think he’s understood some of the risks with getting private businesses involved in delivering services. Some of those risks hit home when Circle Holdings took over the running of Hinchingbrooke Hospital in 2012. Circle’s 10-year deal let the company take out the first £2m of any annual surplus plus a percentage of any further profits, but its total losses over the contract were capped at £5m. As it turns out, they got an ‘inadequate’ rating from the CQC and walked away when their losses hit the cap. There are lessons there about ensuring there is a level playing field and that business models work in patients’ interests. We must also prevent private companies from ‘cherry picking’ those patients least likely to suffer complications, leaving the NHS with the riskier, more expensive cases. In assessing new tech, we should demand really strong medical evidence – and remember that private companies present data to sell their services, not to provide an objective picture. There’s evidence that some telemedicine systems can increase treatment rates without improving outcomes – so providers are paid to deliver interventions that provide no benefits. And there can be a higher risk of false positives or negatives: an analysis in JAMA Dermatology found that mole-checking apps intended to screen for melanoma returned 30% false negatives, which is really dangerous. All these issues can come together in systems which offer medical assessments online. Some are linked to GP practices, and attract young, time-poor professionals who are rarely ill; that can be a form of cherry-picking, when patients are required to withdraw from NHS practices. And some have business models where they get paid for prescribing treatments, creating dangerous incentives. Ali Parsa, Circle’s former chief executive, now runs the telemedicine company Babylon. In January, the British Medical Journal reported that Babylon’s app GP at Hand appeared to be increasing acute care activity – driving up CCG spending. Babylon’s artificial intelligence symptom checker hasn’t been properly clinically validated, and GP at Hand is currently being evaluated; yet the health secretary has visited its HQ and given it his personal backing. For every new service, it’s really important to scrutinise the business model carefully and act only when we’re really confident about the evidence base. In fact, I wish NHS bodies were more willing to follow the evidence when it does show a benefit. Too many trusts and CCGs will only buy a system if they’ve run the trial themselves: there’s a crazy rivalry where they’re not interested in anything that one of their peers is using. So, even after a successful trial, many tech start-ups can’t get more sales, and investors lose faith in the sector. That’s a huge missed opportunity, given how easily scalable many of these services are. There are loads of brilliant health tech businesses out there. And if we ensure that effective, proven technologies that improve patient outcomes and cut costs find a ready market across the NHS, that’ll send the right signal to investors – who’ll then fund the right technologies and business models. But if we’re not scrupulous and hard-nosed enough, trusts and CCGs could end up buying products that funnel taxpayers’ money out of the NHS without improving outcomes. Hinchingbrooke turned the public against privately-run NHS hospitals, and the National Programme for IT stymied progress on information technology for a decade; we face the same risk now with digital health. And it would be a tragedy if we inoculated the NHS against these technologies, because they have huge potential. So, we need to be vigilant about finding the right partners, understanding their business models – and following the evidence, not the PR. The Sharp End is your chance to tell politicians and civil servants how their policies affect your work and your organisation. Most stories are also published in the Guardian. To work with a reporter on your own story, email editor@healthcare-manager.co.uk. When requested, anonymity is guaranteed. Integration could transform our health and care services, argues one social care manager, but time is pressing and demand is constantly growing. In today's NHS, we know it's crucial to protect people who raise the alarm about poor patient care or incompetent staff. But it's just as vital to avoid giving cover to people with axes to grind – as one innocent NHS manager discovered. Dean Royles, director of HR and organisational development at Leeds Teaching Hospitals, calls for a more streamlined system to run the NHS in England. One senior manager says the SNP government deserves credit for its realistic and supportive approach to reforming Scotland’s NHS. The needs of the health service have changed dramatically in recent years but, says one NHS leadership coach, many leaders are stuck in an empire-building mindset. They must junk their instinct to compete – and learn to collaborate. The NHS’s redeployment policies are hugely wasteful of both management talent and public money, argues one MiP member. We explain how MiP is standing up for members affected by the restructuring of NHS England and NHS Improvement, and negotiating to ensure this massive organisational change programme is managed fairly.